I love polenta, although it will always be grits to me. When I was diagnosed with wheat allergies, I quickly transitioned from pasta to polenta, and instead of Cream of Wheat, I started serving this for breakfast, too. I love polenta’s versatility. 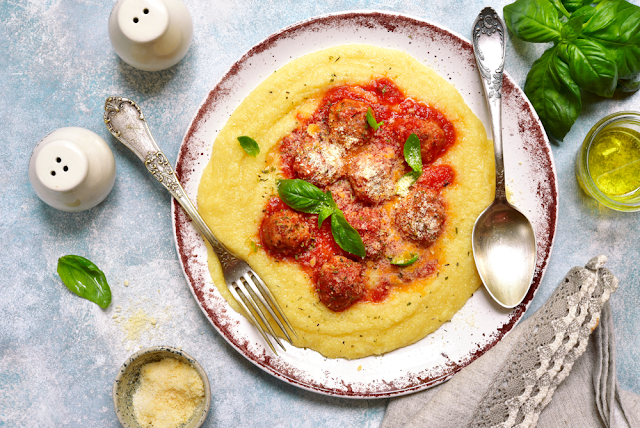 What I only recently began to understand about polenta is that the key to its success is always “slow and steady wins the race.” Pay close attention to these directions: Add the polenta to the boiling water ¼ cup at a time and cook the polenta over very low heat. Adding the cornmeal too quickly causes lumps, and cooking it over higher heat causes it to thicken too quickly, before it’s ready. Whether you choose to serve it creamy or let it set up and slice it, it works with just about any dish. I particularly love it with Ratatouille or a chicken stew. I frankly can’t think of anything much cozier to serve as a late fall or early winter side. 1. Bring the water to a boil in a large saucepan. When the water is boiling, slowly whisk in the cornmeal ¼ cup at a time, making sure that each addition is completely stirred in before adding the next ¼ cup. After all the cornmeal has been added, reduce the heat to low. Cook, stirring often, over low heat for 30 minutes. Remove the polenta from the heat and stir in the margarine. 3. Refrigerate leftovers in an airtight container for up to five days.